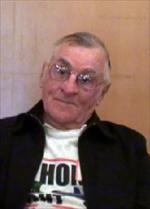 1943 Ralph enlisted in the Merchant Marines for three years then joined the Army for two years in 1945. While in the Merchant Marines ( was the Coast Guard and part of regular service at that time) Ralph was on a Liberty ship the entire time on the East and West coast of the US along with stops at 31 different countries. 1944 Ralph called the Liberty ship “Kaiser Coffin” due to the welding used on them and how easily U-boats could sink them. Ralph had many closed calls with U-boats and even a close call in New York harbor when a tanker exploded right next to his ship. 1945 Ralph enlisted into the Army because his younger brother did not want to go by himself, he was assigned to the 988th engineering battalion bridge outfit for 16 months. Ralph got sick and was very soon separated from his brother who went to Japan. The last of Ralph’s enlistment he ran a Cris Craft power boat in Galveston, Texas for rest and relaxation duty which he loved. Ralph called the Liberty ship “Kaiser Coffin” due to the welding used on them and how easily U-boats could sink them.